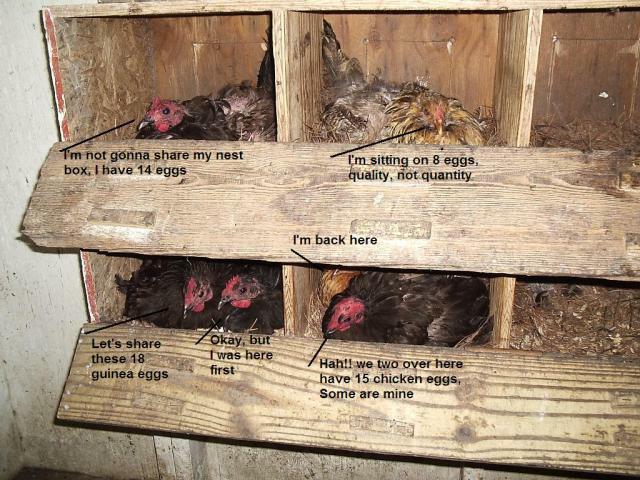 Discussion in 'Chicken Behaviors and Egglaying' started by HeatherLynn, Jan 5, 2011. Ok I had one Australop go broody. Mean mean little thing now. Horrid. I didn't know they could growl. It was very scary considering how dark the coop was at the time. Now my BO has gone broody too. I have the 2 meanest hens in the world right now. The roo even goes near the nest boxes they fluff up and go nuts and if that doesn't work one of them will hop out, beat the heck out of him and then run back to the nest. The BO started a couple weeks after my black girlie. How long will this last? Will it inspire the others to make my life miserable too? If I give them fake eggs will it go away faster? If you don't want them to brood you need to take their eggs away and put them back on the roost. If that doesn't work, put them in a cage for a few days with nothing in it but food and water, that usually does the trick. It's a little early, but usually once one starts the rest start in soon after. It's not necessarily 'contagious' but it is a sign of things to come. Will broodyness spread?-------------hahahahahahahahahahahaha, darn tooting it will, your whole flock can (and probably will) catch the "I want to set eggs" idea. For me, I like not having to incubate eggs that year. For those depending on egg sales and eggs for food----not so much! Oh, and HeatherLynn? I know exactly what you mean about mean birds, I have one named Gertie that I'll show you when you come over. She is not only mean (takes a 'plug' out of my hand at least once a season) but she also screams "GO AWAAAAAAAAAAAAAAAAAAY!!!!" I finally have a camera that also has audio so I'll have to record her this year, she's pretty funny! oh yay.... I have one broody too. So im going to guess ill get more soon. Thats ok. I like broodys hee hee. I hope I get more in spring. I collect eggs probably 4 times a day just so they have no eggs to sit on. I put stuff in her favorite box to block it. She tossed it out and was right back in there. I am tired of getting attacked. Try this: every time you go out there, pick her up and put her on the coop floor. If she just squats and fluffs out, push her along gently with your foot then chase her a little, til she get up, eats, scratches, etc. She'll go back in a few minutes, but meanwhile you have your eggs. After a week or so of this, with a little luck, she will stop being broody. If you have a wire dog cage or the like, you can also put her in there with no bedding so that air hits her bottom (put it up on blocks or something) for 2 or 3 days. They're easier to handle than you think. Usually I simply grab her head and neck from behind her (gently of course; they are not strong at all) with one hand then get my eggs with the other. You can also wear insulated cold weather gloves or oven mitts. Or put a soup can over her head and let her peck the can while you pick her up. It is best to try to break the broodiness if you're not going to give her chicks or eggs, which is the simplest way to do it. They take care of all the keeping the chicks warm; raising baby chicks become effortless. They can stay broody for way over the 21 days if nothing hatches. I actually had one stay broody for 4 months. While broody, they normally get off the nest only once or twice a day to eat, drink and poop. As you can imagine, they will lose weight. In severe cases they can die of starvation. Taking them off the nest and getting them moving at least ensures they eat a little more. I am new to chickens---got first flock in March---so everything is new to me. I LOVE my chickens. I never knew how much I'd love them. They keep me (and my dogs) entertained!! Just this week one of my hens (RIR) started getting broody---I guess. She is in my garage morning noon and night. After the first day of noticing she didn't move, I took her off her spot and put her outside by the water. She just got down on her chest, fluffed up her feathers and made a cooing/clucking sound. When I walk in my garage she makes the same noise and does the same thing. When I try to pick her up she does not try to peck at me or get mean---she lets me pet her. I thought maybe she was dying or something---by the way she won't go to the coop anymore and won't leave the garage. But I have decided that I think she is just broody. We will see. I pulled her off the egg this a.m. and put her out and she ran over to go eat and drink---meanwhile another girl jumped right up on her egg so it's being kept warm. Just this a.m. I put a dot of food dye on her egg so I can tell it apart from others. I am doing an experiment to see if they hatch. How long can an egg be without someone sitting on them and still continue to develop? Do I have minutes? Hours? Hours. I've had them get completely cold when a broody returned to the wrong nest, and they still hatched. They typically will growl and peck when they are broody, but I had one broody who never once pecked, even when I reached under her. I collected eggs for nearly a week to put under a broody, for the chicks I have now. They do best at room temp but some have taken them out of the fridge and hatched them, too. Many on here just mark the eggs with a Sharpie, as I do. Nice and permanent. Also, many on here remove a broody and keep her separate til she "kicks the kids out of the house" around 5 or 6 weeks (varies a lot.) I've tried to do this once or twice but always end up letting the chicks grow up with the flock, as they obviously want to. My 3 or 4 broodies have been good chick protectors. I have a broody pen but my present broody is in one of the nests they all use. For 3 days now, every egg I collected was in her nest. I don't know whether they are climbing in with her to lay or she is stealing the eggs. If you decide to isolate a broody, she will get upset at the new nest and might even stop being broody; that happened to me once. Safer to isolate, leave overnight, and only then, give her the eggs you want her to hatch. It's a ball, isn't it? Good luck.